Cobá is an ancient Maya archaeological site located in the state of Quintana Roo, Mexico, around 27 miles northwest of (and inland from) the town and archaeological site of Tulum. Along with Chichen Itza and Tulum, Cobá is one of the Yucatan Peninsula’s most picturesque and popular archaeological sites. A visit to Cobá offers the opportunity to learn about ancient Mayan civilization and climb one of the tallest pyramids in the area. The name Cobá translates from the Mayan to mean "water stirred (or ruffled) by the wind." The site is thought to have been first settled between 100 BC and 100 AD, and abandoned around 1550 when the Spanish conquistadors first arrived on the Yucatan Peninsula. The height of the city’s power and influence was during the Classical and Post Classical period of Maya history, during which time the site is estimated by historians to have contained around 6500 temples and housed around 50,000 inhabitants. When you visit, after buying tickets at the site entrance, make your way by foot along a pathway flanked by jungle to the first excavated ruins, which consist of a large pyramid, Grupo Cobá, that visitors are permitted to climb, and a ball court. You can then walk, rent a bicycle or hire a rickshaw-style contraption with the driver to travel the paths to the major temple, Nohoch Mul, which is around 130 feet tall and 120 steps to the top. Stop along the way to admire "La Iglesia," the church, a small but lovely ruin resembling a beehive. Around five minutes further on, at Nohoch Mul, you'll have the opportunity to climb to the top for impressive views of the surrounding jungle. This is one of the few pyramids in the area that visitors are still permitted to climb, and this may change in the future, as safety issues and concerns about the deterioration of the building may cause authorities to close off the pyramid to visitors. If you do climb, please be sure to wear appropriate footwear and take care, as the steps are very narrow and steep, and have some loose gravel on them. Cobá can be visited as a side trip from Tulum, with many visitors visiting both sites in one day. As both are fairly compact, unlike some of the other ruins in the area, this is definitely feasible. There are regular buses from Tulum, and the parking lot is situated right near the entrance to the site. If you have your own vehicle, you can also make a stop at the Gran Cenote for a quick refreshing swim in between your visits to the two archaeological sites, or at the end of the day, as it's conveniently located on the way. There are local bilingual tour guides available on site to give you a tour of the archaeological zone. Only hire officially licensed tour guides - they wear an identification issued by the Mexican Secretary of Tourism. 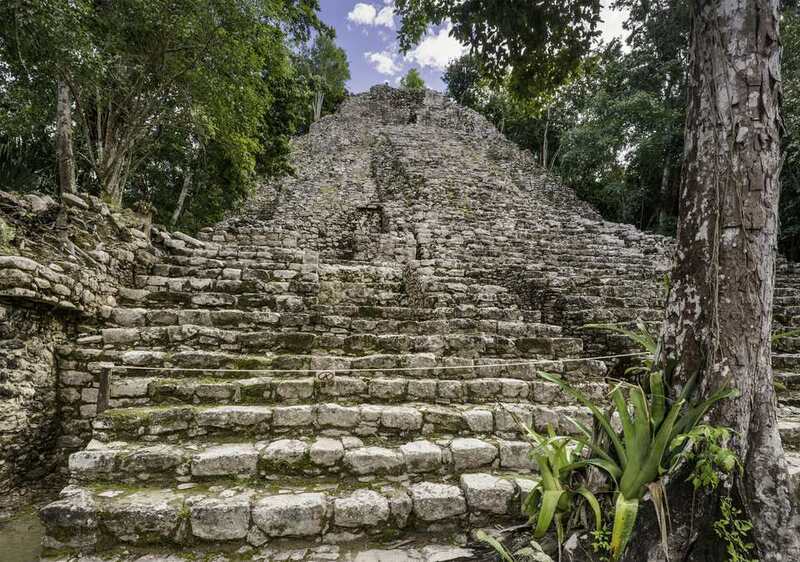 Cobá is an increasingly popular archaeological site, so although it's larger than the Tulum ruins, it can get crowded, particularly the climb up Nohoch Mul. Your best bet is to arrive as early as possible. As with most outdoor tourist attractions on the Yucatan Peninsula, afternoons can get uncomfortably hot, so it's advisable to visit earlier in the day before the temperature climbs too high. Because there can be bike riding and climbing involved, wear comfortable sturdy shoes like hiking boots or sneakers, and carry insect repellent, water, and sunscreen.